A special anniversary recently passed on May 15th—that of the restoration of the Aaronic priesthood. Although it is referred to as the “lesser” priesthood, one could argue that it marked the true end of the age of spiritual darkness that preceded the restoration of the Lord’s Church upon the earth. Therein lies its greatness. Ah, but wasn’t the First Vision the light that cut through that darkness—rather literally, according to Joseph Smith’s description of the glory in which the Father and Son appeared before him—wasn’t that light what initiated the final dispensation? Well, yes, the question that Joseph humbly asked in the grove that June morning was obviously a key turning point. However, what had plunged the world into apostasy in the first place was the loss of priesthood authority. The New Testament is comprised primarily of letters written by some of the Apostles and other leaders as they urged the early members of the Church to stop distorting the gospel and live in accordance with the true teachings of Christ. Sadly, in accordance with prophecies of old, the Church allowed itself to be influenced by enemies both without and within, leading to division, the loss of some precious records, and corruption of the doctrine. Valid priesthood authority is dependent upon the laying on of hands by those who are worthy of holding it, in addition to a commitment to using its power selflessly. As people fell away from the truth, there was no one left to wield and pass along the priesthood. 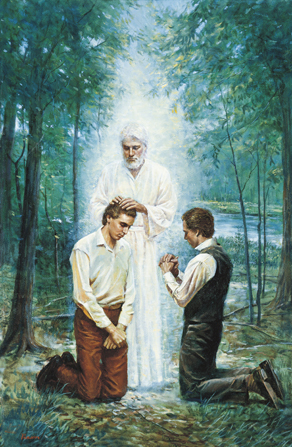 Without the power of God upon the earth, no one could receive the gift of the Holy Ghost, and the fullness of the gospel was compromised almost beyond recognition.The restoration of the Aaronic priesthood ensured that the First Vision did not simply go down in history as nothing more than another obscure celestial sighting. With it, legitimate baptisms could be performed. Sacraments could be blessed and passed to renew the baptismal covenants. Humankind once again held the keys to the ministering of angels. All of this was crucial to reorganizing the Church as God intended it. With the authority to receive revelation and enact sacred rituals in the name of God, the full light of the gospel could finally enjoy the beginnings of a permanent return.